Download Hour1 Download Hour2 This 10th anniversary episode of Unwelcome Guests looks at the claim of US schools and colleges to serve the greater good of society. Are they in fact serving the greater wealth of CEOs by creating a pliable underclass who can be moulded according to the whims of capital? We recall Lyn Gerry's original mission for the show, and contrast that with the US education system. We start with two episodes of Third Paradigm about college financing, and read from Zen and the Art of Motorcycle Maintenance. In our second hour, we compare Jonathan Kozol's analysis of US schools with the similar, but more radical critique by John Taylor Gatto. In celebration of 520 episodes, we begin by reading Lyn Gerry’s introduction from the first episode of Unwelcome Guests. We announce the new website by Robin Upton, http://UnwelcomeGuests.net and invite listeners to help with the show's production by checking out the studio. We start the show by looking at the current state of college financing with excerpts of Third Paradigm shows "The Student Loan Scam" and "Wossamotta U." Then Ben Manski from episode #345 looks at college costs a generation ago, and how corporatization has accompanied a rise in tuition costs. The first hour ends with a reading from Zen and the Art of Motorcycle Maintenance. In the second hour, after an invitation to join an alternative media forum, http://UniverseCity.us, we hear Ken MacDermotRoe interviewing John Taylor Gatto in his History Counts episode, Dumbing Us Down. Then Kenneth Dowst of New World Notes plays the conclusion of one of John Taylor Gatto’s talks, followed by an excerpt from Jonathan Kozol, who observes the same phenomenon but reaches a different solution. Data is presented from Elizabeth Warren and Amelia Warren Tyagi’s book "The Two-Income Trap." Keep in mind, this scheme was never intended... to be destructive, just the reverse. By converting Americans into specialized economic and social functions, into incompletely human human beings, this nation eventually achieved the most reliable domestic market in the world. The human mutilations of schooling are a trade-off for this prosperity. Comfort and security are achieved at the price of personal sovereignty and wholeness. That’s what makes extended childhood a paradox – give it up and people will enter a zone of great turbulence, since most people don’t have a clue what to do to make a living or how to entertain themselves. And the resolution of that turbulence nobody can predict. Well-schooled people have a low threshold of boredom; they need constant novelty to feel alive. With only the flimsiest inner life, they must stay in touch with official voices... The cannot sit still without their minds wandering off to some commercial world or to the stock market... 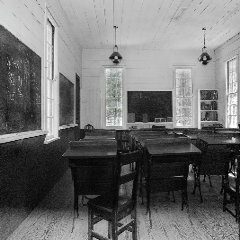 Well-schooled people must be poorly-trained in history, philosophy, economics, literature, poetry, music, art, theology, and anything known to develop a personal inner life... [It converts] spirits designed for independence into whiny, greedy, bored children who define themselves by what they consume... When you next find yourself appalled by infantile and irresponsible behavior that you see all around you, think of school as its forge and try to get rid of it. Thanks to Lyn Gerry for TEN YEARS of incredible content! And to Robin Upton for continuing the tradition and catalyzing it with the best technology that money can’t buy. This, our 10th anniversary episode, was written and produced by Tereza Coraggio, author and host of Third Paradigm. This page was last modified on 27 February 2011, at 04:49.